Since yesterday, the volume of spam comments has gone up even more. Now we get 150 spam comments every 12 hours. (Yesterday it was 21 hours). I promised to tell about what countermeasures we have taken against spam comments. What has that to do with usability? Well, in my opinion, irrelevant comments removes focus from the relevant content on the page, and makes your article less useful because of the irrelevant content. In the last 8 months we had 348 real comments out of 6517 (with the 6,169 being spam comments we removed). Imagine what this blog would be like with 95% spam comments: Each relevant comment buried in 20 spam comments. Before Akismet I was spending more time deleting spam than creating content. Now I can focus on actually blogging! As i mentioned yesterday, an occational spam comment slips through the Akismet filter. Then we mark it as spam, and this way Akismet learns from us so that other users can benefit from this. This is the two things, we’ve done and it’s caught all our spam comments the last days. Recently, Thomas and I met with François Nonnenmacher, a French Capgemini employee blogging at padawan.info. He told that he had been very successful by renaming the files that receive comments — in our case wp-comments-post.php . From his webserver log he saw that many spam comments still hit on the standard comment file names. [/code]And then via DOM scripting change form.action to the proper URL (wp-comments-post.php). 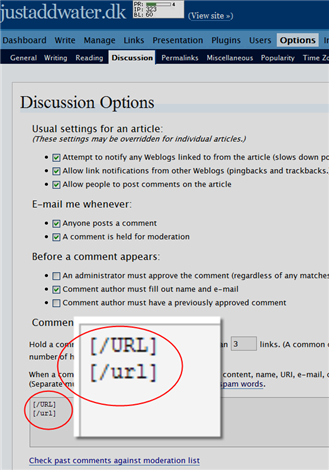 It’s also likely that we might toggle that setting in WordPress, to moderate all comments before they’re published. It’s of course a disadvantage to our readers that they can’t read what other people are saying until we approve it. But we might toggle this setting if it’s necessary and comment spam gets out of our hands. This entry was posted by Jesper Rønn-Jensen	on Saturday, June 24th, 2006 at 23:58 (GMT-1)	and is filed under Accessibility, Blogging, justaddwater.dk, Usability, WordPress. You can follow any responses to this entry through the RSS 2.0 feed. Both comments and pings are currently closed. I’ve been using spam karma in combination with Akismet for the past few weeks. Result: 2400 spam comments and trackbacks stopped. I know Spam Karma from Webword, where one of my comments got caught in the spamfilter. So I really don’t want to use it when comments like my own are marked as spam. The workaround for me was to email John at Webword. He did some detective work and found the comment. Then he re-posted it in his own name but was only able to post a text-only version of my comment: The links I initially posted were gone. I have no problem that comments are held for moderation, but when they’re automatically (and wrongly) marked as spam, it’s a problem. So I’d prefer to avoid Spam Karma (because it’s too agressive). Another thing about CAPTCHA: manually entered spam can get through. There might be a reality behind the weak defense speech in wiki-spammers’ CSS-hidden comments: “We are delicate, we don’t destroy your content. Hungry children to feed.” And, that reality might put our content at spam-risk. That annoyance couldn’t happen with Akismet, or other pattern-matching solutions. reason why it’s listed under “what we might do” is because we might do it if we can’t stop spam comments in other ways. But for now, spam comments seem to have stopped, as we introduced a new trick Thomas wrote about recently: “Avoid Spam Comments part 2“. The comment-receiving script on the original URL is then programmed so that comments are rejected without the text-based CAPTCHA (or held for moderation). and i found it much reliable for the anti spamming. I came here because I was looking for some info about comment spam. I dont have a problem with the spam bots, but some guy started to implant commentspam by hand. Intresting solution you used here at that time..